This weekend, I find myself living the life of a traveling salesman, right here in my own city. 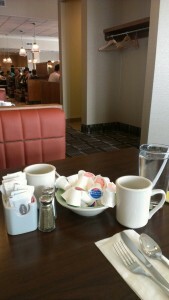 I am living out of a hotel room, and eating Sunday breakfast in the hotel family restaurant. It’s a Perkins chain, although this in the only one I know of in this area. It seems more an American chain. Just sitting here, taking in the atmosphere of the loud Sunday morning family crowd, memories of America and driving trips with my parents and grandparents flow back to me. Everything about it cries American to me. 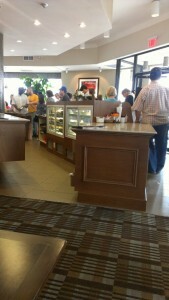 The front cash counter, with a glass display cabinet filled with pies reminds me of the old Howard Johnson, without the orange. The coffee cups on my table are identical to every family restaurant I’ve ever been in, and the noise they make as patrons stir their packets of non dairy cream onto them can be heard from almost every table in the place. A quick look around the place, and I see a wide variety of families, each making their own unique memories.The menu arrives, and is exactly as expected. A multi-page, stapled, plastic laminated glossy, photo filled picture menu starting with breakfast dishes that look so amazing on the page. I order what I always order in places like this. Denny’s calls it the grand slam, and at Perkins, it is – for unknown reasons, known as the fantastic 12, or something similar. The value for food ratio is high. 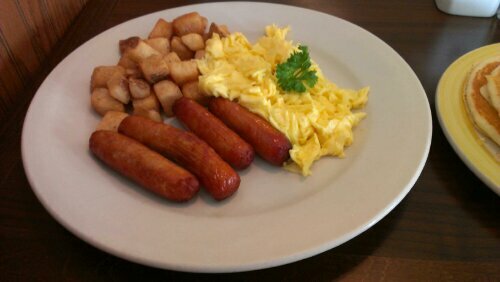 I choose scrambled eggs, sausages, square potato cubes and pancakes, and four of each arrive… Oh. 12.It is far more than I should eat, and a lite more than I can eat, and at the end, more than I should have eaten, but the quality and taste was amazing, especially for $10.99I understand why it is so busy, and begin to realize the crowds are probably equal parts tourist and locals. As pretty and “Jeff friendly” as the easily viewable desert options are, I can’t indulge further. 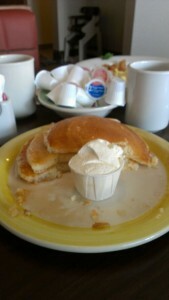 I left 2 full pancakes behind already. I will come again. By now, we’ve all seen the tiny fine print on media advertising that warns us all that the images we are seeing were performed by professionals and we should not attempt. The wording is different, but the meaning is always the same; please don’t bother trying to sue if you are stupid enough to try this on your own. Some lawsuit somewhere in the past probably started it, but now the lawyers seem to have made it mandatory on all commercials where people do just about anything. In many examples, I’m never quite sure whether the disclaimer is meant to be real, or sarcastic or ironic. 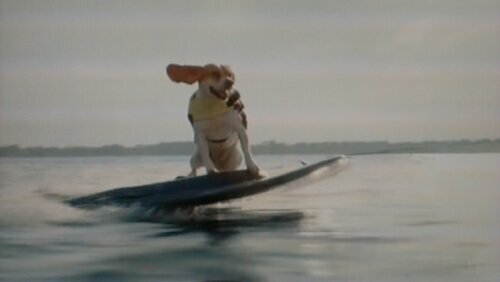 Today I watched a commercial for the Fido cell phone service that had really cute video of dogs, surfing. The music and pace and tounge wagging images made me believe the dogs were indeed, having a great time zipping across the water, much like human water skiers might on any Ontario cottage weekend. Then I caught the fine print. As it turns out apparently, these are professional stunt dogs, and we should not try this ourselves. After I got over the shock of breaking the fourth wall realizing these dogs were being paid to look this happy, I was confused. Do they mean we should not go surfing and water skiing, or our dogs should not? I pondered if this was actually a law. A commercial has told me not to let my dog on a surf board, but if I decide to do anyway, will anything happen? Will Fido be able to sue me? I suppose, if I do dog surf, and my dog breaks a paw, I can’t claim that it was all because the Fido dog looked so happy, they made me do it. Clearly, they told me; do as I say, not as I do. This activity is a spectator sport. Fido dogs are better than my dog. Like all such warnings, they make me question, how does one become a professional, if we are not allowed to perform the activity. In car commercials, I am told all driving is done on a close track by professional drivers, and I am forbidden from attempts. How did they get to be professionals if they can’t try it as amateurs first? Wouldn’t it be funny if everything on tv could only be done once, as long as that disclaimer appeared. It was binding, like copyright. Mazda tries to hire a driver to drive in a commercial and he answers, I’m sorry. I can’t. Ford td me not to attempt that stunt. I think we should do away with the disclaimers. They spoil the fun when they reveal the things we are watching are professional stunts. Instead, they just create a blanket “no fault stupidity clause” that says you can’t blame TV if you hurt yourself being stupid trying something you saw on TV. I ate green olives today, probably for the first time ever. I say probably, because the event was so un-memorable, it is conceivable, I have done it before, and just forgot. The taste had a slight familiar feel to it, almost as if I thought was green olives ‘should’ taste like, from their smell and texture. It was on a pizza, at a buffet, so I only had to try a few on one slice. I didn’t like it much, but I didn’t hate it enough to spit it out, like I do when an onion finds its way into my mouth by accident. If I was at a dinner party, and olives were served to me, I could politely down a few without a fuss or a face. That is how I rate new tastes now. If I was forced to, there are still some foods I would have trouble with. Others I can eat, but olives won’t be added to my acceptable toppings list today. I do try new foods now and then although my friends would still call me picky. I have a philosophy I battle with. If I know I enjoy something why risk trying things I don’t. Bad tastes can stay with me far too long. A single bit of onion can cause me grief for hours. Of course, I have found new tastes I enjoy and add them into my routine. When I was young, my acceptable food list was very tiny. Everyone had to pick the restaurants that could suit my limited list. Back in the 70s of course, we had burgers and Chinese food restaurants and not much else. Italian was the special place, and I could always have a pizza. Today is Friday, and more people show up for the Pizza Hut buffet, so the variety is good. I didn’t need to try olives. I could have waited 3 minutes and something else would have arrived. I’m enough of a regular at this location that they know I don’t like onions or mushrooms. It just felt like a day to test. No need to try again. Posted in Lunch Blog, Personal. Tagged Piza Hut.